Hi, I'm Renee I've been a "cat person" all of my life. I grew up under the show hall tables as my mother raised Siamese, Orientals and others as I was growing up. I have always been fascinated by cheetahs, leopards, and any wild cat. They are just the ultimate! That is what led me to a hybrid program. I wanted a cat with the wild look, and the domestic personality. And that is what our goal is here at Cattitude ranch. I bottle raise all of my babies so that they will be use to being handled and petted and in love with their new human families. Call or email me for current availability. 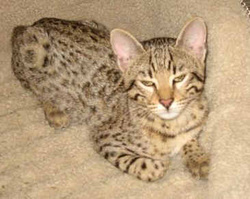 Marechal Cattery South - South Carolina Beautiful and exotic Safari cats. 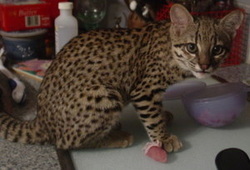 These cats are extremely hard to breed. We have kittens available occasionally. Well socialized, healthy kittens - Guaranteed! !